If each year could be associated with a right, 2011 was undoubtedly the year of freedom of assembly. The uprisings now collectively referred to as the Arab Spring that began in North Africa in late 2010, spread throughout the region during the year. Well after the dramatic regime changes in Tunisia and Egypt, mass protests continued in Algeria, Bahrain, Egypt, Yemen,Saudi Arabia and Syria, where a particularly brutal repression, still ongoing, attracted unanimous condemnation internationally as well as sanctions from the Arab League. Inspired by the Arab Spring and exasperated by decades of corrupt authoritarian government, civil society mobilised in many countries in other regions of the world, particularly in Africa. Protests, either linked to elections or to high commodity prices, erupted in Angola, Malawi, Swaziland, and Uganda – to name but a few. In Angola, demonstrations started in March to protest against the 32-year rule of President dos Santos. The demonstrations, which continued with varied intensity throughout the year, were met with unnecessary and disproportionate force by the police, which also violently prevented journalists from covering the events. Though protests did not develop as intensely in other regions, regimes in Asia were worried enough to restrict their laws and regulations. Bangladesh, Cambodia, and Malaysia were in the process of passing new restrictive legislation. In Malaysia, the House of Representatives passed the Peaceful Assembly Bill, which outlaws street protests and authorises police to impose conditions, including time, date, and venue. Organisers of unauthorised assemblies would face hefty fines. At the time of writing, the bill remained pending in the Senate. China responded to anonymous online calls for protests by disappearing up to two dozen human rights defenders and questioning and threatening scores of others. Instances of violent dispersal of protests and refusal of permission to hold assemblies also occurred in many countries in Europe and Central Asia, including Azerbaijan, Belarus, Georgia, Kazakhstan, the Russian Federation, Serbia, and Uzbekistan. In the latter, faced with a de facto ban on protests, human rights defenders challenged the authorities and organised several small demonstrations: they were violently dispersed by the police, participants were arrested, questioned and sentenced to the payment of fines. Protests were also violently dispersed in Latin America. In Cuba, in particular, the authorities launched a crackdown reminiscent of the 2003 mass arrests of human rights defenders, pro-democracy and political activists. Against this backdrop, the creation by the United Nations Human Rights Council of the new mandate of the Special Rapporteur on the rights to freedom of assembly and of association was very welcome. It is hoped that it will contribute to better protection of human rights defenders worldwide, and that it will elicit more cooperation from states than the Special Rapporteur on human rights defenders has so far enjoyed. The Arab Spring also confirmed the essential role that the Internet, in particular social networking sites and blogs, play in disseminating information and facilitating mass mobilisation. However, the very same tools were monitored and used by governments to identify and target critical voices, as occurred during the uprisings in Syria. Governments also restricted the use of more traditional communications technologies to pre-empt protests: for example, SMS access to Twitter was suspended in Cameroon in March. Bloggers as well as HRDs and journalists using the Internet for their work were arrested or put under surveillance in Bahrain, Burma, China, Cuba, Egypt, Ethiopia, Kuwait, Rwanda, Saudi Arabia, Singapore, Thailand, United Arab Emirates (UAE), and Vietnam. 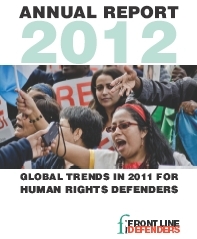 2011 also confirmed most of the trends identified last year, in particular with regard to the killing and criminalisation of human rights defenders. Killings continued unabated across all regions. Latin America continues to be of particular note in this regard. In Brazil, one of the few countries with a governmental protection programme for human rights defenders, five HRDs or family members were murdered as a result of their activism. HRDs and journalists were also killed in Colombia, Democratic Republic of Congo (DRC), El Salvador, Guatemala, Honduras, India, Indonesia, Iraq, Pakistan, the Philippines, Thailand, Uganda, and Yemen. These killings were across a broad range of human rights issues: those who lost their lives included environmentalists, trade unionists, journalists, HRDs working on sexual orientation and gender identity, indigenous issues, elections, corruption, women’s rights, land, and community rights. The cases Front Line Defenders reported on represent only a fraction of the total number of individuals killed because of their involvement in human rights. Virtually all abuses against human rights defenders were committed in a climate of absolute impunity, across all countries and regions. In Russia, two years after the killing of human rights defenders Natalya Estemirova, Zarema Sadulaeva and her husband Alik Dzhabrailov, no effective investigation has been carried out. Similarly, no justice has been delivered in Burundi for the murder of Ernest Manirumwa in 2009, despite an intense national campaign and the involvement of foreign experts in the investigation. A similar situation prevailed in Indonesia for the 2004 murder of Munir Tahib. Those who remained engaged in campaigning for justice in these murders were targeted and harassed. In Colombia, organisations have raised concerns regarding the lack ofeffective investigations into filed complaints, where the authorities failed to link multiple complaints or identify patterns of threat. In some limited cases, domestic and international pressure forced governments to act. However, only the material perpetrators were tried while the intellectual authors of the crime remained unpunished. This is the case in the DRC, where five police officers were sentenced in June for the 2010 murder of Floribert Chebeya; however, former Chief Police Commissioner John Numbi, who invited Floribert Chebeya to the meeting where he was murdered, was suspended from duty but never investigated, called as a witness or charged. While physical attacks continued to occur, the use of the legal system has become the favourite tool of governments in suppressing criticism and limiting the space for human rights activism. An increase in the adoption of restrictive legislation affecting human rights defenders has been widely acknowledged in recent years. Restrictive legislation, be it on NGO regulation, media, public order, terrorism, or criminal defamation, provides the basis for the criminalisation of the work of human rights defenders. A quarter of the cases Front Line Defenders publicly reported on during the year concerned cases where HRDs faced criminal charges. The number of countries where this occurred indicates how widespread the phenomenon is. Cases were reported in Azerbaijan, Bahrain, Belarus, Burundi, China, Colombia, Congo, Cyprus, Ecuador, Egypt, Honduras, India, Iran, Israel, Kazakhstan, Kuwait, Kyrgyzstan, Malaysia, Mauritania, Mexico, Morocco, Nigeria, Oman, Peru, the Russian Federation, Saudi Arabia, Syria, Tanzania, Thailand, The Gambia, Turkmenistan, UAE, Uzbekistan, Vietnam, Western Sahara, and Zimbabwe.